It isn’t often that a town’s name comes from its church, but that is our blessed heritage. Our parish dates to the 1850s, when fourteen German Catholic families built a log structure, 18 feet by 32 feet, on a 20-acre site by the Crow River. Having a church building, the settlers were then able to draw priests in from among the few available missionaries. One of these, Fr. Francis Xavier Weninger, SJ, dedicated the new church to St. Michael the Archangel during the first week of September 1856. In 1866, as our parish grew, we acquired new property at a place that would come to be known as “the intersection” of the village of St. Michael. 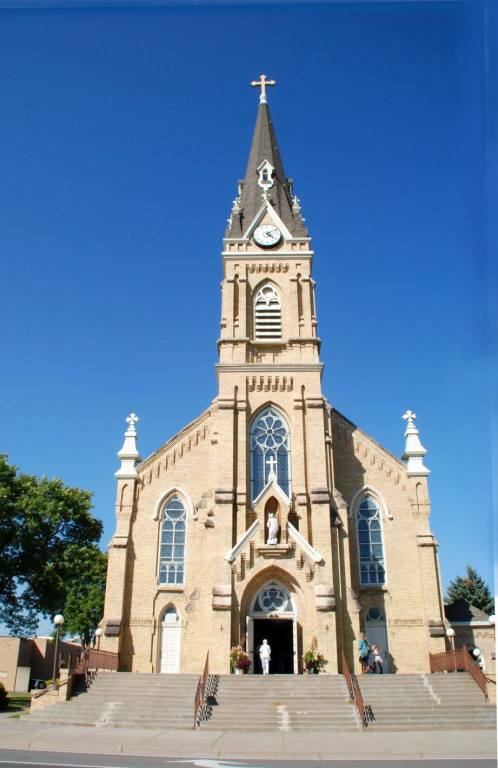 The parish’s second church was constructed on the northeast corner of what is now Main Street and Central Avenue. The first St. Michael Catholic School building soon followed. Erected next to the church, our school opened in September 1876, beginning 142 continuous years of forming Catholic children. Although side galleries were added to the church in 1878, they were only a temporary improvement to a facility that could no longer minister effectively to its members. 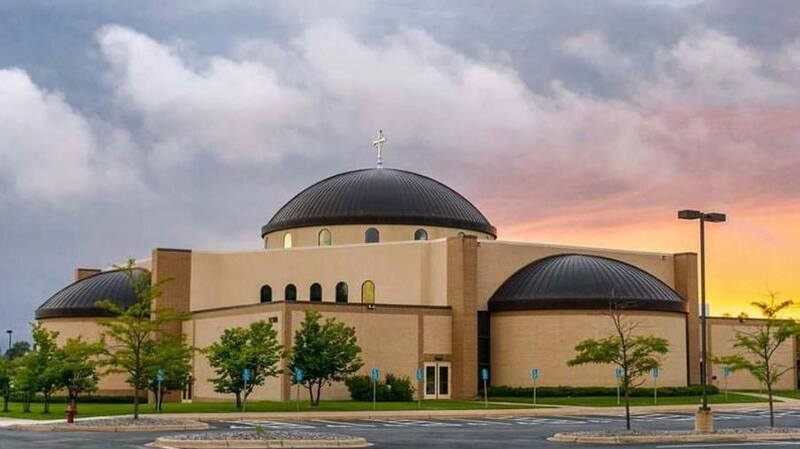 The time had come for another major investment to support our mission, and the parishioners rallied behind it. On Sept. 29, 1892, a new church was consecrated on the other side of Main Street, which was to serve the parish for 112 years. Yet by the 1930s, although the church was still in its prime, the school building was not. Once again the parishioners moved to address the situation, and in the fall of 1940 the doors of our current school building opened across the street from the church. With an expansion in 1962, that school building is still in use today, although the majority of the facility is now almost 80 years old. As the 100th anniversary of the church building approached, it became increasingly apparent that it could not serve the needs of the parish much longer. Not only was the building showing its age, but it was far too small for our burgeoning population. By 2002, some $1.5 million had been pledged for a new church. A capital campaign was launched, and in 2003 ground was broken for our fourth church on Frankfort Parkway. On December 19, 2005, our current church was consecrated for sacred worship. St. Paul wrote in Ephesians 2:30, "You are part of a building that has apostles and prophets for its cornerstone...a house where God lives in the spirit." The people are the true "church" of St. Michael, more important than any building. With their involvement and the offering of their gifts, time and talent, the "body of Christ" in our area continues to grow and flourish. Source: Bob Zahler, Faith, Family & Farming: A History of St. Michael, Minnesota (2009).